Home Richmond Archive by category "Richmond Events"
Being a full time caregiver of an elderly loved on or family member is challenging and can be very stressful and overwhelming. 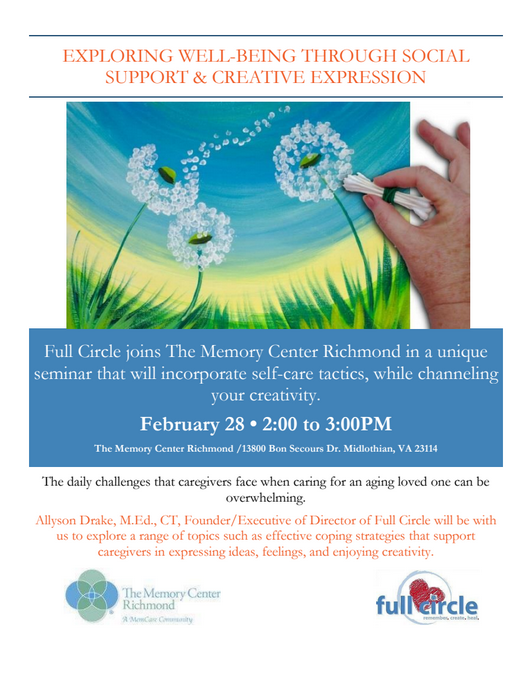 The Memory Center Richmond is pleaded to welcome Allyson Drake of Full Circle to discuss a range of topics to help caregivers cope with day-to-day challenges and learn to express their ideas and creativity in new ways. This event is free and open to the public at The Memory Center Richmond, 13800 Bon Secours Drive (adjacent to St. Frances Medical Center) Midlothian, VA 23114. 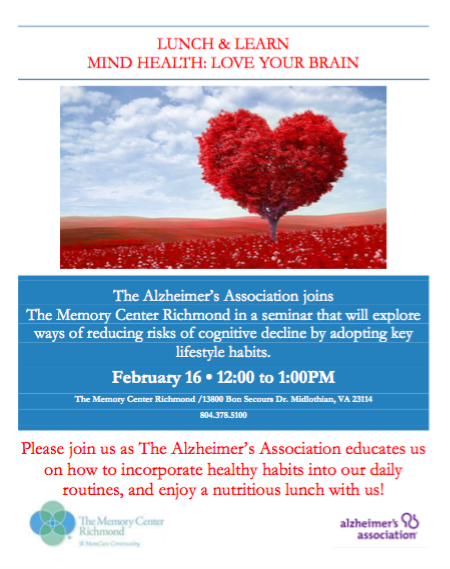 The Memory Center Richmond and the Alzheimer’s Association invite you to join us for a special lunch and learn event. As more and more of the population ages Alzheimer’s disease and other forms of dementia are becoming part of our daily conversations. Learn what you can do now to reduce your risk of cognitive decline. This event is free and open to the public. Lunch will be served. 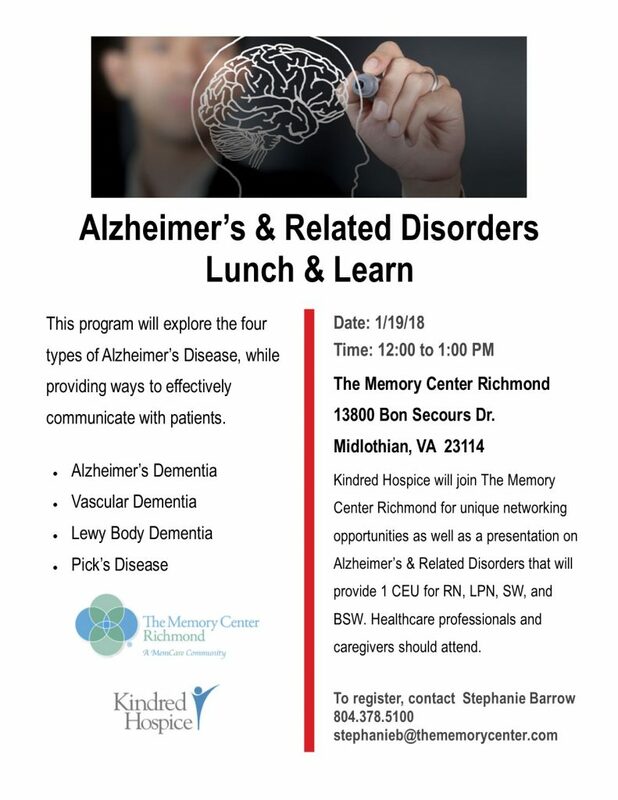 Join The Memory Center Richmond and Kindred Hospice for a special lunch and learn. This one hour program will explore the four types of Alzheimer’s disease and tips to effectively communicate with patients. This course will benefit caregivers and healthcare professionals including RN, LPN, SW, and BSW who will earn 1 CEU. The holidays can be challenging, especially when caring for a loved one with Alzheimer’s or other form of Dementia. Let us help ease the stress and join us for a special event. 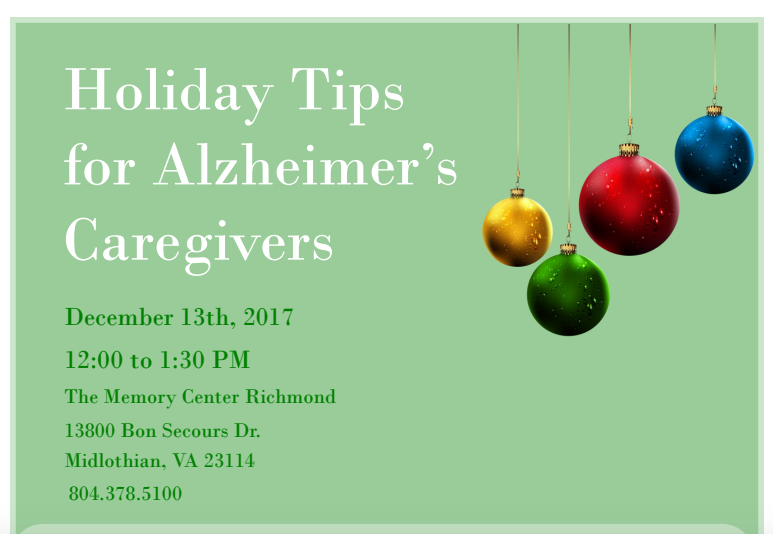 Hear from The Alzheimer’s Association and learn effective holiday tips, which will include creating a safe, stress free environment, along with individual and family preparation supporting you and your loved one. As a caregiver, we understand getting away can be difficult, so your loved one is welcome to join. You can even creating memorable moment with the opportunity to design your own personalized holiday ornament. Join The Memory Center Richmond for a special holiday event and help us give back to the Alzheimer’s Association! Channel your creativity and join in decorate a small Christmas tree anyway you like. Drop your decorated tree by The Memory Center, Richmond by December 1st. Beginning December 2nd all donated trees in our lobby through December 15th. Stop by and to view the trees and choose your favorites. If you see a tree you like, purchase a raffle ticket for only $10 and the tree could be yours to take home. All raffle ticket proceeds go the Alzheimer’s Association. The raffle will take place during our Holiday Social on December 13th from 5:30 p.m. – 7 p.m.. You may also purchase raffle tickets at the social. Download the attached flyer or call 804-378-5100 for more information. The Memory Center, Richmond is located next at 13800 Bon Secours Drive (adjacent to St. Frances Medical Center) in Midlothian, VA 23114. Alzheimer’s disease touches almost everyone in some way, and many people ask what can they do to help prevent Alzheimer’s or slow the progression.As the population in the US ages and Alzheimer’s becomes more and more prevalent, these are important questions to ask. 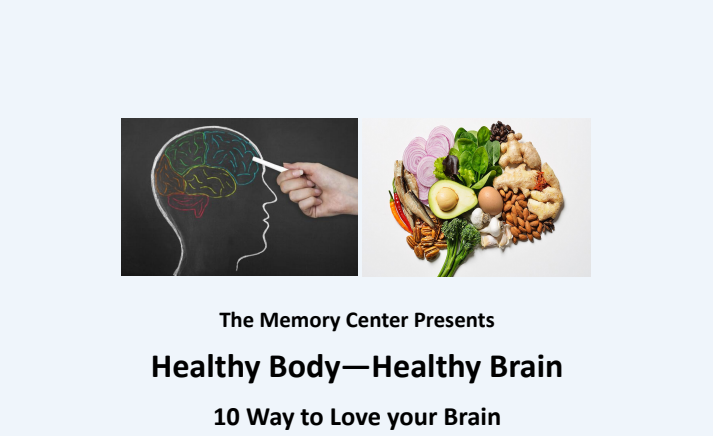 Join us at The Memory Center, Richmond on November 9th as The Alzheimer’s Association will be here to discuss daily choices for a healthy brain and much more. Complimentary refreshments from our brain food bar will be served. This event is free and open to the public, but space is limited. Reserve your space today by contacting Stephanie Barrow at 804.378.5100 or stephanieb@thememorycenter.com. If you’re a wartime veteran or spouse looking for assisted living – did you know you can be eligible for up to $1,794/mo from the Department of Veterans Affairs! The seminar will be held June 27th, at 6pm and is free and open to all the public, so come enjoy some refreshments on us and learn about how you qualify. Tell us you’ll be attending on Facebook! The Memory Center, Richmond is excited to announce our Party On The Patio Concert Series featuring well-known artists including Susan Greenbaum, Suzie “MoJo” Johnson & Garrett Lamb, and Kelli Moss & John Holmes. Join us in beautiful outdoor courtyard and sunny Town Center and experience some of the best music Richmond has to offer. These events are free and open to the public! So gather your family and friends and head to The Memory Center for some great summer music! 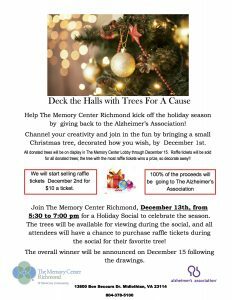 Click for a flyer or read more about The Memory Center Richmond. According to the Alzheimer’s Association, by 2025, the number of people age 65 and older with Alzheimer’s disease is estimated to reach 7.1 million — a 40 percent increase from the 5.1 million age 65 and older affected in 2015. Currently there is no cure for Alzheimer’s but you can help promote awareness, programs and research by supporting the Greater Richmond Walk to End Alzheimer’s event on Thursday April 27th. Simply stop by Argyle Cupcakes in Chesterfield near Robious & Huguenot Road on April 27th between 11am and 7pm and purchase any of their delicious treats. Argyle will donate 20% of your purchase to help end Alzheimer’s disease. Just present the flyer below or mention The Memory Center at checkout. The Memory Center, Richmond is a unique assisted living community setting the new standard in memory care to help those with Alzheimer’s and dementia live well. Our custom designed community addresses the needs of those living with memory loss. Filled with natural light our safe indoor and outdoor spaces allow for freedom of movement and independence including a Town Center, secure courtyard and walking trails. We offer personalized services and the industry’s best staffing ratio of 4:1 and 24/7 nursing oversight. Don’t take our word for it. Come see The Memory Center, Richmond for yourself during our Spring Fling open house. Reservations aren’t required and all are welcome. For more information contact us at (804) 378-5100.